237:05… That is how many minutes Pekka Rinne went without having a single goal conceded on him, smashing the old modern era record, funnily enough also right here in Ostrava, by more than 30 minutes! But like all good things, it sadly came to an end today against the Belorussians who have been a real surprise in this tournament. It is insane to think that in a tournament of this caliber in this day and age, that a goalie could go over 11 periods without conceding a goal, a feat that may not be challenged any time soon. The goal that ended the streak could have been a vital one and a heart-breaker to the Finns as it came in the third period to crack open the 0-0 hockey game. Yevgeni Kovyrshin ripped one top cheddar past Rinne 5 minutes into the final frame, at least it was a good goal that ended the streak. Belarus looked poised and determined as they came in off a 7-0 thrashing defeat to Russia and could clinch a birth in the quarter finals with a win. But Finland would not shy away as they banged home two quick ones less than a minute apart and just like that, they had the lead. With time winding down Belarus kept pushing but Rinne showed the world why his shutout streak lasted so long and was not looking like he would give up another. With 30 seconds to go and Koval on the bench for the extra attacker Belarus once again wired one at Rinne that no goalie could stop and so we headed to overtime. With Finland carrying the pace of the game through overtime Rinne had little to do, but he stayed on his toes and was very alert when he needed to be. The shootout saw Finland jump out on top with a goal from Jarkko Immonen and Rinne make a big stop on Sergei Kostitsyn which turned out to be the only save of the shootout. In the second round both teams scored, making the score 2-1 going into the last round of shooters. Jussi Jokinen then buried one in the third round to earn them the victory and grab the extra point which could turn out to be very crucial. 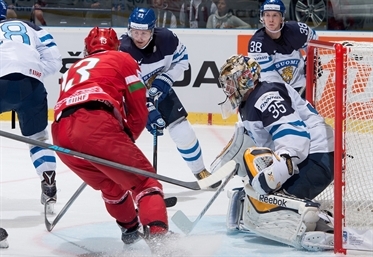 Next up for Rinne and the Finns is Russia who may turn out to be an even tougher opponent than Belarus, with both teams battling it out with the Americans for top spot in the pool.